Good question. 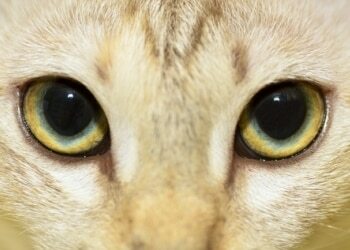 Your cat’s large, round eyes are designed to operate far better in low light conditions and the dark than our eyes. As hunters who are active at dawn and dusk – the best times for them to stalk prey – cats can actually see as well in pitch black as we can see in full moonlight. Here are two reasons cats’ eyes glow in the dark. 1. Take a look at her eyes some evening under a bright lamp. Notice that the pupils are elliptical in shape, compared to our circular ones. In the lamplight, the pupils are narrow slits because they are protecting the sensitive retinas from damage. Now turn the lamp off and notice that her pupils dilate to accommodate the lower lighting. In a very dim light, the pupils will fill her eyes, making them look almost completely black. Interestingly, some feline eyes glow green rather than red depends on the color of the cat’s eyes. Blue eyes, which Siamese cats have, glow red, while golden and green eyes cast green glows at night.